« Miao is getting Younger!! 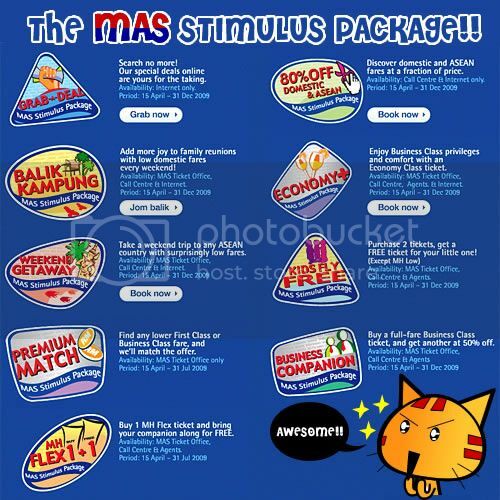 Yeah, MAS airlines just announced their Stimulus Packages which comes with 9 types of packages to suit everyone needs which is so awesome. If I could travel anywhere, I will just use more than one packages from MAS to travel over a week. Now I have only one problem, whether my boss will give me a one-week leave or not? Posted on May 5, 2009 by Jian Akiraceo. This entry was posted in Contest and tagged Great Escapade, Mas Airlines. Bookmark the permalink. go0d luck on persuading your b0ss for a 1 week holiday.later u blog about it.tee hee. You got how many day leave left?? Let me see.. hmm 1 day? Kolok Mee for the win!!! Great. 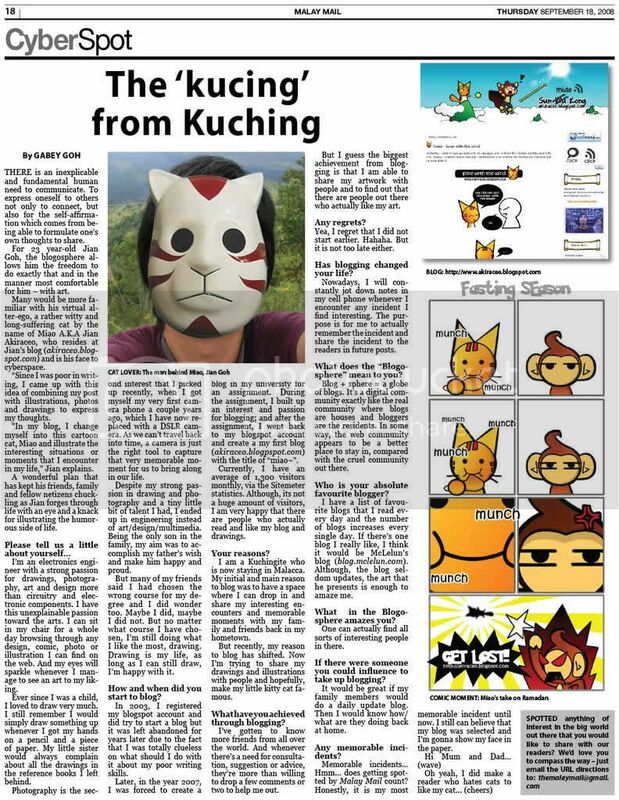 Wah Miao writing advertorial liao la..? Woah! I love your plan! It’s awesome! Haha. Can utilise those packages, huh? Hi, i just found your blog through Nuffnang, and i think i’m a little too addicted to your cute cat. In my head the ‘so cute!’ ‘soooo cute!’ doesn’t stop lol. Each facial expression is hilarious and spot on la! Beside home food, there are more.. Seriously its very deadly.. since its transferable through people.. ><!! daddy got misai de meh??? Its better to go back as often as possible.. In my opinion..
its not that great really..
hahaha meow, i support u … u told ur boss u got H1N1 then need quarantine for a week cannot come to work. I bet he will be approved for sure. Uwaaaa. They offer those kinda packages? Kitten wants! So I can fly back to Penang. Me miss Tok Tok Mee rawr. Woah what is Tok tok Mee? miao/akiraceo/jian/wafudafu? wah so confusing. i know people ask you this like a million times, but how do you draw these?? isit like the draw on computer with a pen thingy? Just stick to miao so it wont be so confusing :P.
Ahahaha.. i guess i was really lucky to be able to go home for one full week !! Pingback: Summary of Miao 2009 « Miao & WafuPafu Comic Blog | Cuteness Overdose!